A subscription box is a service where you receive items for a monthly fee. The boxes are usually beautifully packaged and each one has a theme. Subscription box services started in 2010 with the inception of Birchbox, a makeup company that sends similarly themed makeup products once a month in a box. Since then, subscription companies selling a variety of retail items have snowballed in popularity. 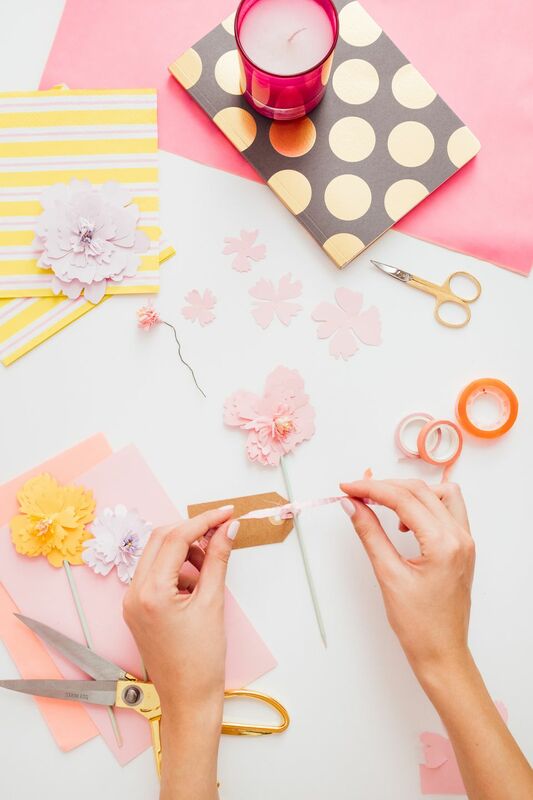 If you are the type of person that loves crafting, but is short on time, a craft subscription box service might be for you. Just pay a monthly fee, and you'll have craft projects and supplies delivered right to your door. The boxes contain everything you need to complete the craft, without any money wasted on extra supplies. The directions provided are easy to understand, and it's a great way to try out new crafts. Craft subscription boxes are the perfect gift for the makers in your life. Show someone how special they are by taking the time to gift a DIY project. Imagine their delight each month as they open their surprise box filled with exciting craft projects. The Crafter's Box is a subscription service that targets adult makers. Some examples of their featured projects are handcrafted paper flowers, naturally dyed fiber art wall hangings, large-scale fabric stenciling and punch needle art. What makes The Crafter's Box special is that they guide you through the process from start to finish. Each box has quality materials and tools, chosen by the featured artist of the month. The Crafter's Box has a podcast for each craft project and a live Q&A session with the expert maker. You'll be guided every step of the way, guaranteeing successful projects. They also have a moderated craft forum where you can go to show off your work, find help with crafting issues, and interact with like-minded people. Ann Williams is a company based out of Michigan that caters to people of all ages who love crafts. They offer four different subscription plans: ages 6 to 8, ages 9 to 12, teens, and adults. The projects range from fashionable string art animals to designer scarves and bowls. Additionally, their website offers instructional videos for some but not all of the craft projects. Smart Art is a bit different from other craft subscription services in that they cater to people who are interested in fine art rather than crafting. When you join, you can expect to receive a box containing 6 to 8 full sized art supplies, a unique step-by-step project, and a pamphlet detailing a new art medium. The art projects offered are designed to help beginning artists grow their abilities. Seasoned artists will become more proficient and develop higher skill levels. Sketch Box is a monthly subscription service whose mission is to fuel your artistic fire. Each box contains a variety of art supplies and a piece of art. The art serves as inspiration for the supplies provided in the monthly box. There are two types of plans: basic and premium. The premium plan contains higher quality art supplies. The goal of Sketch Box is to provide artists with easy access to supplies and a place to gain exposure for their artwork. Art pieces made with Sketch Box products are featured on the Sketch Box website and Instagram. Lesser known artists have a chance to bring their artistic vision to the world with the help of Sketch Box. Quilty Box is a service that delivers subscription boxes filled with items quilters will love. Each box contains a card with information about the quilt expert that curated the box for that month, a pattern, and quilt fabrics. Extras are also included and vary from month to month. The company offers three types of subscriptions: Quilty Box Classic, Jinni Beyer Box (a limited edition subscription), and Quilty Box Mini. Past boxes have included gem magnets, lip balm, wine cork heart crafts, string art, and poured soaps. Each project is made from carefully curated supplies that are all eco-friendly. The primary goal of Adults & Crafts is to make DIY crafting as easy as possible for their customers. They feel that many people want to make beautiful trendy crafts but often become frustrated by incomplete instructions and a lack of time to buy the various supplies needed to do a craft project. Adults & Crafts does all the prep work for you. You don't have to worry about making craft mistakes; They have worked out all the problems ahead of time, so you don't have to deal with costly mistakes. Examples of their monthly craft boxes include a lovely cement fire bowl, lavender oatmeal soap, a wood burning kit, and a photo transfer wooden wall plaque. It's no secret that during the past few years people have discovered that coloring books can bring stress relief. Chroma Club has lifted coloring books to a new level. They hire indie artists from around the globe to illustrate their coloring books. You can have fun and also relax while adding your special color touches to beautiful drawings. When you join, you will receive gorgeous and unique coloring books every month. They also promote community by sharing finished coloring projects on social media.